Our Products >> .50 Beowulf, Full Metal Jacket, One Cartridge not a box. 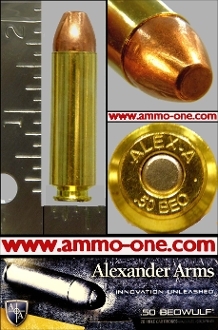 One Cartridge not a box: .50 BEOWULF by Alexander Arms, factory loaded using new Alexander Arms brass with “ ALEX-A * .50 BEO” Head-Stamp and loaded with a 335 grain “Rainier” FMJ (Full Metal Jacket Projectile. This extreme Pistol & Rifle Ammunition for the AR-15 platform was introduced in 1999 by Bill Alexander of Alexander Arms, U.S. Army Radford Arsenal Radford, Virginia USA. The cartridge has an extremely rebated rim vs. the case diameter for use in the AR-15 Pistol & Rifle. Providing a semi automatic light carbine with the performance of the venerable 45-70 rifle. .50 Beowulf, Full Metal Jacket, One Cartridge not a box.